Hey guys! I've gotten so many requests to go over how I pack my train case ever since I bought it in this haul. Since I took it with me for my 2-month trip to California, I wanted to share with you what I took and how it was organized. It took a lot of trial-and-error to fit everything in place as well as to select my favorite essentials to bring along, so I hope this inspires some of you in how to pack your own train case! I'm actually currently in makeup purging-and-reorganizing mode, so it's nice to have a little reminder of what amount of makeup is actually useful for an extended period of time. If anyone has tips for organizing makeup, feel free to leave them in the comments! I hope this was helpful for those of you who are about to pack a lot of makeup for a trip, or if you just want to organize your makeup at home and want ideas for how to categorize everything. Thanks so much for reading and I'll talk to you guys soon! Thanks for that! So informative! Do you think you could do a review on all the foundations you have used in the past years and how you would rate them and also which staple foundation you always go back to and why? wow! That's a lot of products! I know this may sound really stupid, but what is your metal spatula for? That kind of threw me off? I keep my brushes in a separate brush container or brush roll, but it's possible to fit a few individual brushes inside. I have been searching EVERYWHERE for a brush roll. Can you tell me which one you have and where you got it? Thanks! Great video! I have a small Caboodles train case from Walmart. 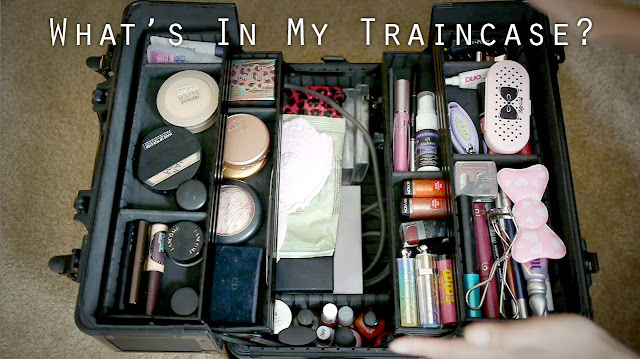 When I bought it I thought it'd have more than enough room to store my makeup...but I was wrong haha! Love your Sephora one, I like how you can customize the compartments! Really keen on getting a train case myself! Interesting, I enjoyed watching this video! Thx for sharing! Was surprised that you didn't pack the make up for ever full cover concealer...wasn't that one of your new favorites? I didn't include any of the items that I purchased while out there since technically I didn't "pack" that for my trip, but I kept it in the area with the other concealers! I see! Tks for ur reply. Could you also show how you normally store your makeup? that's amazing, excellent organization and I'm guessing it holds up well on plane rides? no spillage? & also I'm guessing you needed a lot of makeup because you were doing other people's makeup as well? That's a lot of makeup you put in there! I always take with me what I really need. Nice organizing :-). Honestly, it's a pretty significant/heavy size, but maybe she can bring it for carry-on and put things inside it! If you are getting rid of some makeup you should sell box what can be used and let people buy them for a flat rate plus shipping. I don't know if that would work since my friend was purging her scrapbooking supplies. Hahhah Just a thought! What color are you in the neutrogena healthy glow foundation? I've been wanting to try it and we're the same color in mat velvet so I think I might be the same for that one as well. Thanks! We have similar skintones (I'm NC30, tending to 35 in the summer) so I would love to see a review of the different foundations and concealers you've tried! I recently bought the Missha Perfect Cover BB Cream and I quite like it but also want to have an option with more coverage, maybe a concealer to pair with it. yeah we girls should also arrange and beautify our things not only our face. just posted here to say missing you MRS JEN. Jen,from u I inspired to be a beauty blogger. what kinds of your make up you have ?? ?